Brownie Lake Park	Brownie Lake's rustic nature and remote location make a great place to get away without leaving town. The lake is off limits to motorized watercraft, but available to canoes and kayaks. Canoe launch and rack located on north side of lake. Brownie Lake is the smallest and northernmost link in the Chain of Lakes. Name: The name of the lake predates the creation of the park board in 1883. “Brownie” was the nickname of Agnes McNair, the daughter of William McNair who owned the land. In a 1913 plan for the development of Glenwood (Wirth) Park, park superintendent Theodore Wirth labeled Brownie Lake “Hillside Harbor,” but there is no record that the park board ever officially changed the name of the lake. Brownie Lake was acquired as a part of the 100-plus acre expansion of Glenwood (Wirth) Park and the acquisition of portions of the southern and western shores of Cedar Lake in April 1908. In 1927 Brownie Lake almost became better known when the park board approved a suggestion from the park superintendent and the city engineer that the name of Cedar Lake Road in Glenwood (Wirth) Park be changed to Brownie Lake Road, to distinguish it from Cedar Lake Parkway around the lake, if the city would agree to change the name of Cedar Lake Road from the park to Western (Glenwood) Avenue. The city apparently did not agree. The park land west of Brownie Lake is the largest park area in Minneapolis ever to be sold. Thirty-two acres of Wirth Park west of the lake were sold for $200,000 to the Prudential Insurance Company in 1952 as a location for the company’s regional office. The park board bowed to intense public pressure to sell the land. Prudential had made it clear that the site adjacent to the lake was the only site it would consider for its offices in the city. 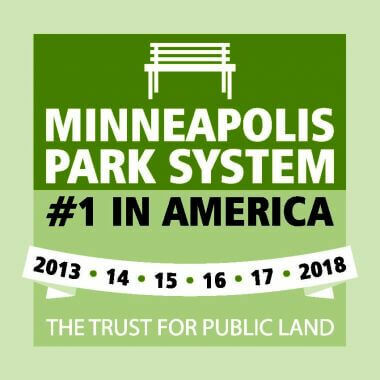 Ultimately the park board was convinced that the benefit to the Minneapolis economy was a greater good than keeping the land as a park. The board justified its action in part by asserting that with the growth of traffic on Highway 12 (now I-394) and the widening of that road, the land west of Brownie Lake had already been isolated from the rest of Wirth Park anyway. In 1958 Brownie Lake became the connecting link between Basset’s Creek and the Chain of Lakes as a plan was implemented to pump water from the creek to raise lake levels. Years of below-average rainfall had left lake levels at historic lows. 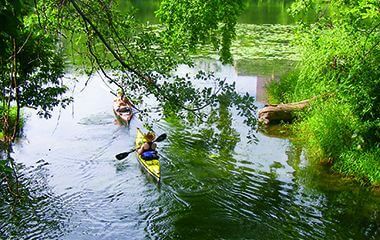 At that time the water level in the channel connecting Lake Calhoun and Lake of the Isles was too shallow to navigate even in a canoe. Bassett’s Creek, which flows from Medicine Lake in Plymouth, had never suffered the low water levels associated with Minnehaha Creek, which made it the target of those seeking a source for water in the Chain of Lakes. 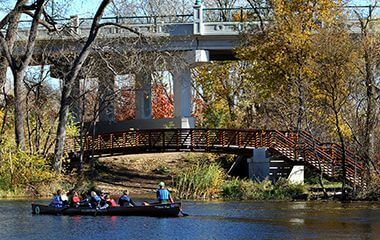 At various times in the history of Minneapolis parks and as recently as the late 1930’s the park board had used city water to raise lake levels, but the cost of doing that had become prohibitive. In much earlier times the idea of connecting Wirth Lake and Brownie Lake by a canal had been considered but abandoned when it was determined that the elevation of Wirth Lake was 37 feet lower than Brownie Lake, thus the need for a pump to get water from Bassett’s Creek to Brownie Lake. The level of water in the lakes was important, because many recreational facilities—docks, bath house, and boat house—were permanent facilities that required relative proximity to water. Initially the pumping station on Bassett’s Creek raised lake levels, but not even that creek produced enough water to raise the levels of four lakes and keep them at an acceptable level. So in 1966 a pumping station was constructed on the Mississippi River to pump water from the river into Bassett’s Creek and from there to Brownie Lake. Pumping from the river caused concern beginning in the 1970s, when the water quality in Minneapolis lakes first became an issue. Critics of pumping river water into the lakes noted that phosphate levels in the river were too high to be acceptable in the city’s lakes. The pumping station on the river was dismantled in the 1990s. 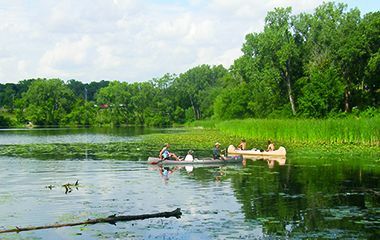 Brownie Lake was the target of a campaign to remove invasive plants and improve vegetation management in 2007 and a canoe rack was installed near the north shore in 2009. Trail improvements, a new canoe launch, 75 new trees and other landscaping features were completed in 2014. The project was enhanced by a trail easement donated by Target Corporation, which occupied the former Prudential Insurance offices. 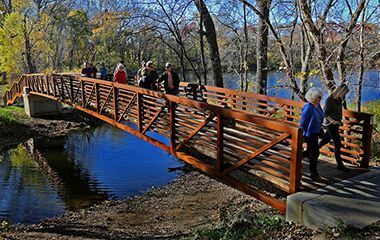 The first “Black Diamond” mountain biking trail in Minneapolis was completed in Brownie Lake Park in 2016. 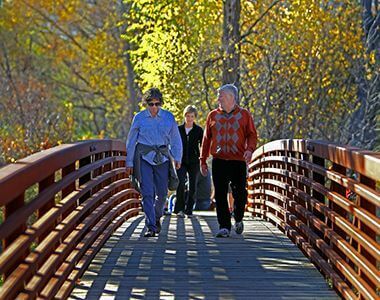 Enjoy a shady stroll and lake views along Brownie Lake Park's paved walking trails. An annual permit allows you to store your canoe or kayak. View canoe/kayak permit details.